– Licensed by the UK Gambling Commission, the Swedish Gambling Authority and the Malta Gaming Authority! Casilando is a brand new online casino that delivers an impressive collection of top-quality casino games, outstanding player promotions and a well-tailored casino product. They were launched in April 2017 and has already become a very popular destination for online casino players. Casilando’s games portfolio includes a wide range of different game types like video slots, jackpot slots, table/card games, video poker games, instant win games like scratch cards and keno games, bingo, live dealer games and virtual games such as a nice set of football games. The game providers that Casilando use are all market-leading game vendors including NetEnt, NetEnt Live, Evolution Gaming, NYX Gaming, Microgaming, BluePrint, Merkur, StakeLogic, Quickspin, Thunderkick, Aristocrat, 1×2 Gaming, ELK Studios, Ezugi, Lightning Box just to name a few. This combination of game providers ensure a highly entertaining online casino experience. The Casilando website has a smart, modern and cool design which is fully responsive on all devices. It is very easy to navigate through the website and locate everything. The game lobby has several filters and a search function which will help you to find your favourite game. You can filter the game lobby by game provider, most popular games, latest games and A-Z listing order. Casilando is available in several different languages; English, Finnish, German, Norwegian and Swedish. The customer support is available 24 hours a day, 7 days a week. The support is fast, professional and accurate. If you need to contact them, make sure you check out the Help page before since they do have some information that might help you to resolve the issue by your self. You can reach the Casilando support desk by e-mail or by the live chat function which is located in the bottom right corner all over the website. Casilando is owned and operated by White Hat Gaming Limited. They are licensed by the UK Gambling Commission, the Swedish Gambling Authority (Spelinspektionen) and the Malta Gaming Authority. Casilando meets the highest standards of player safety and fairness. 10 No Deposit Free Spins on the Book of Dead video Slot! New and eligible players residing outside Sweden and the United Kingdom will get 10 no deposit spins immediately upon a successful account registration. The 10 no deposit spins will be available in the very entertaining Book of Dead video slot by Play’n GO. Please note that the 10 no deposit spins are not available for players residing in the United Kingdom or Sweden. Click here to claim your 10 No Deposit Spins in the Book of Dead! Casilando offer a great set up of very generous welcome bonus offers for new and eligible players. The welcome bonus offers are different from one country to another some make sure to check here below and see what deal that applies for you. Players in the UK: First Deposit Bonus of 100% up to £300 + 90 Bonus spins on Book of Dead! “18+. New players only. Min deposit £20. Bonus spins are valid on Book of Dead only. Bonus funds are 100% up to £300 and separate to Cash funds. 35x bonus + deposit wagering requirements apply. £5 max bet with bonus. Bonus must be used within 30 days, spins within 10 days, otherwise any unused shall be removed. Terms Apply. BeGambleAware.org “. Players in Sweden: First Deposit Bonus of 100% up to 3000Kr + 90 Freespins on Book of Dead! If you’re located in Sweden you will be able to double your first deposit up to 3000kr. In addition to the deposit match bonus, your first deposit will also give you 90 bonus spins in the Book of Dead video slot. 18+ / Spela ansvarsfullt / www.stodlinjen.se / Regler & Villkor gäller. Players residing in the Rest of the World: First Deposit Bonus of 100% up to €/$300 + 90 Bonus Spins! 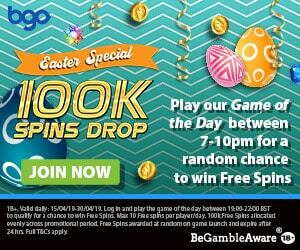 Players residing in other accepted countries out side the UK and Sweden are eligible for 10 no deposit spins upon sign up and a first deposit bonus of 100% up to €/$300 + 90 bonus spins. The no deposit spins and the bonus spins will be available in the Book of Dead video slot. 18+, Terms Apply, Please Play Responsibly. Click here and join Casilando and claim your Welcome Bonus! More Bonus Promotions at Casilando! Casilando serve a great menu of regular and time limited casino promotions besides the welcome bonuses so make sure you check your e-mail inbox on a regular basis when you are a member of this casino. You don’t want to miss out on free spins offers on new video slot releases, re-load bonus offers and much more. You can also enjoy a number of ongoing casino promotions at Casilando. How about the Thursday GetAway which gives you a 50% deposit bonus up to €/$250 + 20 free spins in Aloha: Cluster Pays! every Thursday. You will earn loyalty points when you are a real-money player at Casilando. The points are awarded when you play your favourite casino games. The loyalty points can be exchanged into casino bonus cash. For example, if you exchange 1,250 loyalty points you will get a €/$5 casino bonus added to your account. This is obviously a great treat for all players that want to know that they will be rewarded for playing at a specific online casino. Casilando offer a large selection of payment methods that are suitable for eligible players. These include credit/debit cards, direct bank transfers, e-wallets such as NetEllet and Skrill (e-wallets do not qualify for the deposit bonuses) and several regional methods that differ from one country to another like Sofort, OchaPay and dotpay. All transactions and other stored information are secured by the most advanced encryption technology available. Safe and secured indeed. Casilando house an amazing collection of online video slots which is provided by the best casino games producers in the online casino industry such as NetEnt, Micrgaming, ELK Studios, Quickspin, Thunderkick and Aristocrat among others. This means that you will always be able to access the latest and most popular online casino slots at Casilando. Some of the most popular video slots at Casilando at the moment are Hall of Gods (progressive jackpot slot), Starburst, Thunderstruck 2, Butterfly Staxx, Ivanhoe, Wild Jane, Hong Kong Tower, Jack and the Beanstalk, Redroo and Jurassic World. Casilando also offer some of the highest-ever online jackpot slots like Mega Moolah (current world record holder of highest online jackpot ever to be won), Divine Fortune, Arabian Nights, Hall of Gods, King Cashalot and many more.